Whenever you’re in the mood for something simple and easy, you can never go wrong with spaghetti and meatballs at A Taste of Italy. This cute little restaurant deserves attention because they offer delicious food at a reasonable price, plus you can expect quick service. Guests who come in for the first time head to the counter and order the food upfront and choose a booth to sit in. 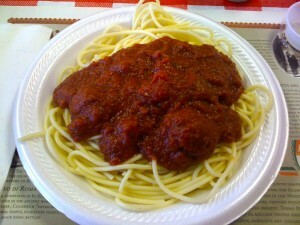 On this trip, the spaghetti and meatballs was a classic choice. The marinara sauce tastes a little tart, but it works well with the pasta and meatballs. In addition to your main course, they offer a light salad while they prepare the pasta. It may not be much, but you get some greens while you wait for your food. What is surprising is the buttered Italian bread because it tastes so delicious. When you expect toasted bread, it should be a bit crunchy on both the crust and inside; however, when you sink your teeth into the bread it is super soft and super buttery. 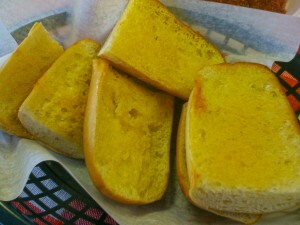 They spare no waste at great bread to go along with your meal! So when you are in the mood for the classics, A Taste of Italy is the place to go. It can work as a family night to get some Italian food for a good price. Their atmosphere is a bit quiet, but that doesn’t mean you can’t have a bit of peace while dining in. If you’re not a spaghetti fan, they offer lasagna, and Italian-style sandwiches. While their selection is quite small, it’s still worth the try to get away from the big restaurant names and popular places for something different. This entry was posted in Dishes by Roger Renteria. Bookmark the permalink.